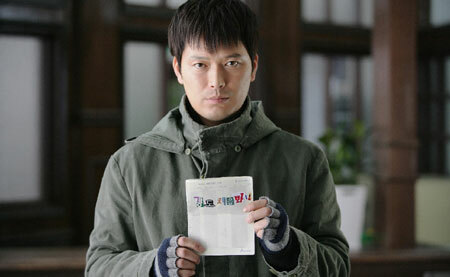 Jung Jae-Young in Going By The Book. The Skinny: The concept is enough to make this a winner. Too bad the filmmakers get as sloppy as they do. Decent commercial fun that collapses when one applies any real scrutiny to it. But that's just nitpicking. Most audiences will probably be fine with Going By The Book. Pleasing undemanding audiences seems to be the main goal of Going By The Book. Written by Jang Jin (Guns and Talks) and directed by Ra Hee-Chan, Going By The Book has a fun, high-concept storyline and an able lead performer in Jung Jae-Young (Welcome to Dongmakol). The droll actor portrays traffic cop Jung Do-Man, who's such a tightwad about his job that he'll even give a traffic ticket to the new police chief (Son Byung-Ho) when he violates a minor law on his way to work. The action is commendable in a Joe Friday sort of way, but it puts Do-Man into hot water with his new boss, who takes out his ire by assigning Do-Man the role of "robber" during the upcoming police training exercise. A rash of bank robberies has the local populace in fear, so the cops plan to restore public confidence by staging a robbery and riding to the rescue - all in front of the media. Do-Man is meant to be the fall guy, and he obliges, though he mutters a warning to his boss: "You may regret it." Does he ever. As the local and even national media look on, Jung Do-Man proceeds to make his fellow cops like fools, holding a bank hostage while preventing other cops, the SWAT team, and his hostages from stopping his one-man bank job - which in case we have to remind you, is totally make-believe. Going By The Book manages an entertaining cleverness thanks to the pretend nature of the robbery as well as Do-Man 's diligence. He researches his planned robbery thoroughly, and when the cops show up thinking that they'll nab him easily, he proceeds to turn the tables, making many smart moves and invoking the various rules of their pantomime cops and robbers game as support for his continued upper hand. Do-Man turns off the electricity, disables the cameras, locks all the doors, and proceeds to fake shootings, beatings, and other terrible behavior all because he's been assigned to be the bad guy. If it weren't so flagrantly annoying, his dedication would be commendable. Going By The Book gets tons of mileage out of Do-Man's antics, as he takes things so far with his assignment that he should obviously be fired for insubordination and making a mess of official police business. Then again, this is an avowed commercial film, and as such is manufactured for mass crowd-pleasing effect and very little realism. There are some surprising and very funny jokes, and Jung Jae-Young is so adept at his straight-shooter character that he proves quite amusing. Indeed, Going By The Book offers plenty of easily-digestible, though somewhat self-satisfied commercial fun, and the concept and Jung's performance are funny enough to float the film for a while. The "by the book" concept is given to exacting guidelines and lots of verbal bantering, and Do-Man's adherence to his duty plays like affable, light satire. The cops can't run their crime-stopping playbook during the fake robbery because Do-Man thought ahead and set up stuff that would have blocked their moves. Even when challenged verbally, Do-Man usually has a quick, pretend reply, playing his role of robber to the hilt. The concept is self-referential and a tad overplayed, but it's entertaining nonetheless.